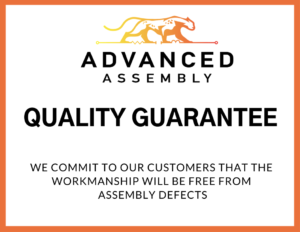 At Advanced Assembly, quality is our top priority. That means we stand behind our work unconditionally. If you every have an issue with our workmanship, please contact your sales representative or client service representative. Each browser is a little different, so look at your browser’s Help menu to learn the correct way to modify your cookies. If you disable cookies off, some features will be disabled that make your site experience more efficient and some of our services will not function properly. However, you can still place orders. We have implemented DoubleClick Platform Integration. We along with third-party vendors, such as Google use first-party cookies (such as the Google Analytics cookies) and third-party cookies (such as the DoubleClick cookie) or other third-party identifiers together to compile data regarding user interactions with ad impressions, and other ad service functions as they relate to our website. We honor do not track signals and do not track, plant cookies, or use advertising when a Do Not Track (DNT) browser mechanism is in a place. When it comes to collection of personal information from children under 13, the Children’s Online Privacy Protection Act (COPPA) puts parents in control. The Federal Trade Commission, the nation’s consumer protection agency, enforces the COPPA Rule, which spells out what operators of websites and online services must do to protect children’s privacy and safety online. In order to be in line with Fair Information Practices we will take the following responsive action, should a data breach occur: We will notify the users via email within 1 business day. We will notify the users via in site notification within 1 business day. Policies and warranties are important factors to consider with evaluating PCB assembly partners. Yet there are many more. Click here to read our guide on “Finding ‘The One’ for You” – a guide to help you in selecting the right partner for your project.